Swamp coolers are often used in hot, dry climates like Glendale Arizona. They are also known as desert coolers because they work best in a dry environment. Swamp coolers are known to be less costly than a regular air conditioner, both to purchase and to run, but the high temperatures in Arizona can overwork the motor of any air cooling device leaving you in need of Glendale swamp cool motor repair or a rebuild. The concept of a swamp cooler is fairly simple, it’s based on evaporation. Water from a reservoir must be pumped through a filter. Air from outside the house is cooled by being blown through the wet filter and into the home. They work best in a dry climate because they rely on the contrast between the humidity and the temperature of the dry air. The greater the difference between the humidity in the temperature of the dry air the better a swamp cooler will work. 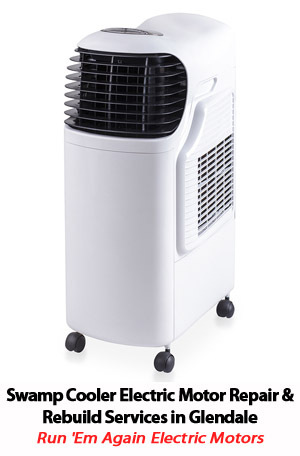 Similar to an air conditioner, a swamp cooler contains electric motors to run a blower and a water pump. The motor and pump are encased in a metal box which is lined with a cellulose material similar to sponges. When the swamp cooler is running the pump sends water to keep these sponges wet. A fan draws warm, outside air through the wet sponges which cools the air by the process of evaporation. The cooled air is then blown through vents into the home. Whether you cool your home with a swamp cooler or an air conditioner, the constant use required during the summer is hard on the electric motors. If you are in need of swamp cooler motor repair or a swamp cooler motor rebuild the experienced technicians at Run 'Em Again Electric Motors can help. If you don’t have time to wait they carry a variety of new Glendale electric motors and are also authorized dealers of swamp cooler motors from most major brands including A.O. Smith, Westinghouse, GE Motors, Century, Dayton and others. Homeowners often shy away from using so-called swamp coolers to cool their homes. Many view the technology as outdated, while others say it is simply ineffective. In reality, swamp coolers are ideal for use in the dry climate of Phoenix. If you own a swamp cooler and have noticed a dip in performance lately, Run 'Em Again Electric Motors offers quality swamp cooler motor repair in Glendale. Swamp coolers use simple technology to keep your home cool. The process to cool used by this type of system relies upon the principle of evaporation. Your swamp cooler uses a motor to pump water into fibrous pads that absorb the water. Another electric motor kicks in to power a fan that pushes air through the pad of fresh water and into the room. The evaporation process ends up reducing the temperature of the air and adding humidity. In the arid climate of the Valley of the Sun, a swamp cooler is an effective system for cooling your home and adding humidity to the air, creating a comfortable environment inside your home. However, the simple technology of a swamp cooler can fail and leave you sweating the heat inside your home. For swamp cooler motor or blower motor repair, Surprise locals depend on us. As mentioned, the primary functions within a swamp cooler rely on a pump motor and electric fan motors. When one or both of these motors fail, you need the assistance of qualified technicians to diagnose the problems and use the proper replacement parts to help bring back the cold air in your home. Run 'Em Again offers evap cooler motor repair Peoria residents need when their electric motor fails. If the electric fan motor is in disrepair, your swamp cooler won't push cold air through the vents in your home. Our Glendale swamp cooler motor repair service uses only the best replacement parts from brands such as GE, Marathon Electric, Armstrong, Bell & Gossett, and more. Run 'Em Again Electric Motors is a family-owned business that was started in the 1950s by one man. Today, our business is under third-generation management and brings 50 years of experience meeting the need for swamp cooler motor repair in Glendale. In addition to testing to diagnose your problem and a full inventory of replacement parts to enhance turn-around time on repair jobs, we also offer certified rebuilt motors and rebuilt pumps to help get your swamp cooler running smoothly again. Call us today and find out why residents in Glendale, Peoria, and the surrounding areas call us when they need to get their swamp cooler back in working order. Run ‘Em Again Electric Motors specializes in repairing and rebuilding commercial, residential, and swimming pool electric motors and pumps. That includes blower motors for air conditioners or swamp coolers. With more than 60 years of experience in this industry, you can rest assured that we are highly skilled and knowledgeable. We will work diligently to repair your motor to proper working order. No job is too big or too small. If you need blower motor repair in Surprise, AZ, trust the experts at Run ‘Em Again Electric Motors. Call us or stop in today to discuss the options available to you.